When you try STEL Order, the first thing you’ll notice is how quick and easy it is to use. Your information will also be made safe at all times with encrypted communications and regular back ups. At least 89% of our customers have increased their revenue since they began using STEL Order, and all of them have improved their business image and customer service. From your office, home, a meeting, the beach or on the move. Manage your company wherever you go using your PC, smartphone or tablet, even when you don’t have an internet connection. Over the phone, via email, chat, our help center or by watching our tutorial videos. You will always have access to the highest standard of help and support whenever you need it. 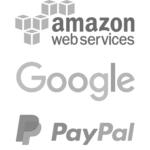 The online invoicing program your company needs for sales and customer management. STEL Order is an online invoicing software that will make your business and life easier. You can use STEL Order to synchronize all of your information safely on the cloud, which means you can access all of your company data from your PC, smartphone or tablet. You can do this even when you don’t have an internet connection. STEL Order makes the technology that large corporations use available to small and medium-sized business owners and entrepreneurs. A complete online ERP that’s easy to use and allows you to carry your office around with you wherever you go. An online product and service catalog that is always up to date with prices, images, stock information and much more. An online product and services catalog that is always up to date with prices, images, stock information and much more. Create, sign and send estimates, orders and delivery notes from anywhere at any time, using your smartphone or tablet. Create, sign and send price quotes, orders and delivery notes from anywhere at any time, using your smartphone or tablet. Create and manage invoices, access their payment state, then sign and download them as PDF files, wherever you are. Create and manage invoices, access their payment state and download them as PDF files, wherever you are. Create and share events and tasks with your colleagues or technical staff. Add automatic notifications for each new task. Create and share events with your colleagues or technical staff, and add automatic notifications for each one. A complete online CRM with detailed client information: history, account balance, map locations, contact details and more. Assign incidents to your technicians and manage your maintenance operations using your smartphone or tablet. Manage all of your purchases easily and in just a few simple steps: suppliers, purchase orders, delivery notes and invoices. Sales by product, total tax amounts, outstanding and completed payments, and much more…. More than 4.000.000 estimates accepted - More than 12.000.000 invoices paid. "I can't work without STEL Order now"
STEL Order has really helped me manage my technical service agency. I can now assign incidents directly to my technicians who can carry out the work and then create their own delivery notes and invoices using their phones. When we started using this software, we had 6 technicians working for us. We now have 17 technicians and our office staff have doubled their productivity despite the increase in work. "The best one I've used so far"
I use STEL Order to manage my business and to sell different products and utilities to restaurants. I use my tablet and smartphone to show my products and to take new orders from my clients. I also create delivery notes and invoices, even when I’m at home. The truth is that it’s an amazing program, and it’s the best one I’ve used so far. Keep up the good work guys! "Great software with an even better support team"
STEL Order allows us to manage our IT services and security cameras in real time. We can create estimates, delivery notes and invoices using our phones or from our main office just as easily. We also use it to manage our workshop orders. A great software with an even better support team. We fully recommend it. I love this program. 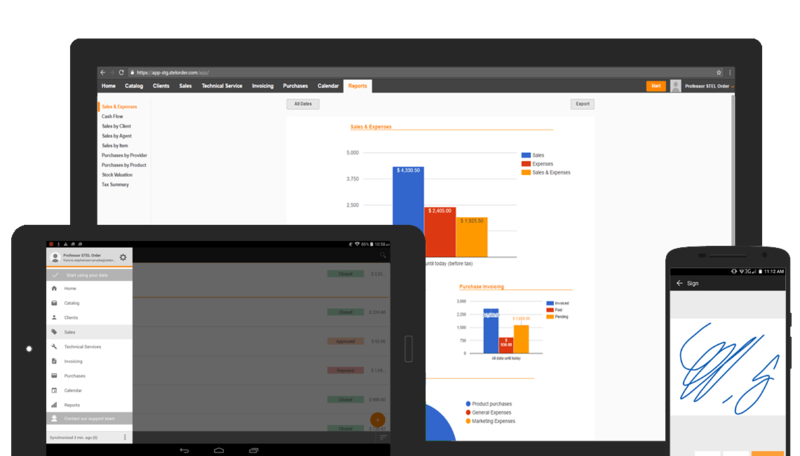 It allows me to manage my client incidents and to send them estimates and invoices using my phone. I used to need a full-time office worker, but now my wife just helps me out from time to time since I can manage everything myself. I recently hired a sales consultant and gave him full access to STEL Order so he can send estimates and show our products using the online catalog.